BBC One - Panorama, Cancer: Hope for Sale? 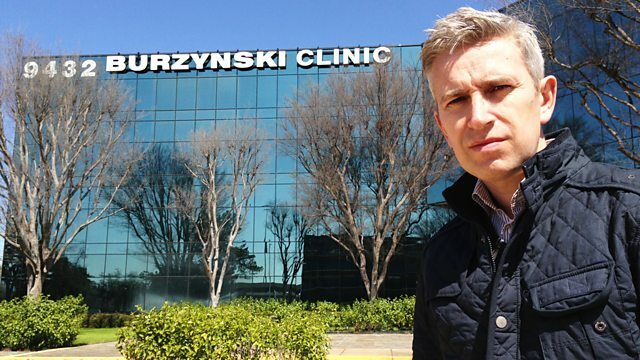 Richard Bilton investigates a controversial American doctor who claims he can cure cancer. Why has he been allowed to sell an unproven and experimental treatment for 30 years? Reporter Richard Bilton investigates a controversial American doctor who claims he can cure cancer. Celebrities have helped raise hundreds of thousands of pounds to send British patients to his clinic. But Dr Burzynski's treatment has been dismissed by mainstream medicine and the US authorities have tried to close him down. So why has he been allowed to sell an unproven and experimental treatment for 30 years?